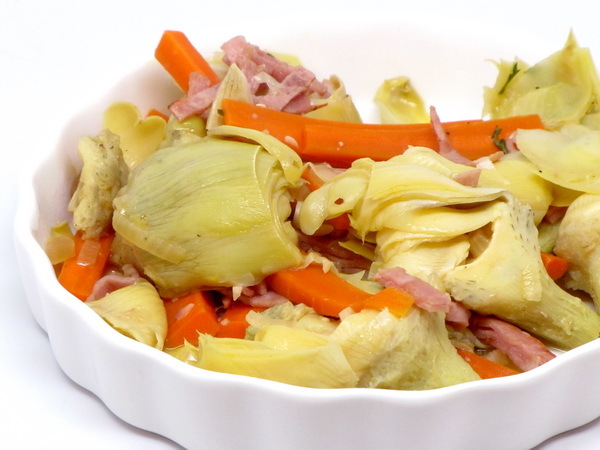 Do you LOVE artichokes? Then this is for you !! 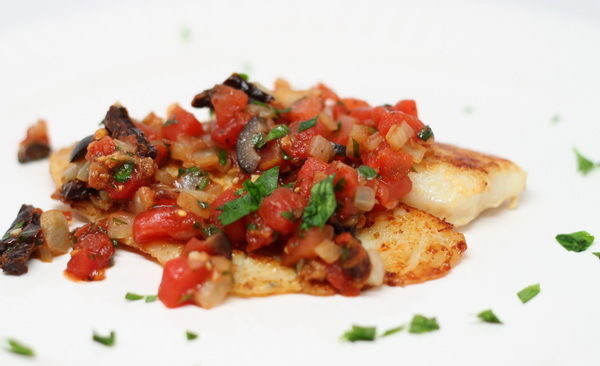 This is a great hearty dish with lots of flavor. Serve next to some broiled chicken sausage for a great healthy meal. Heat the oil in a skillet on medium heat and sauté the onion and garlic for 7 minutes. If they start to dry up, add a T or so of hot water. Add the carrots and ham and cook another 4 minutes. Stir in the artichokes and cook another 3 minutes then add the wine and bring to a boil and cook 4 minutes or until the liquid is reduced by half. Then add the broth, thyme, pepper and salt and return to a boil then reduce heat to a simmer and cook 10 minutes or until the artichokes are tender. Add the parsley and butter at the end just before serving. 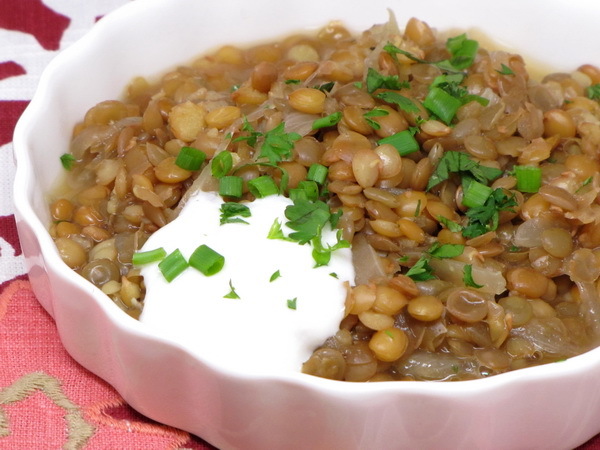 I love lentils in soup. This recipe uses them in a super savory stew with enormous flavor. Try serving as a lunch or as a side to a fish or chicken dinner. Heat oil and add onion. Cook 15 minutes or until soft and golden. Add some very hot water a tablespoon at a time if the onions start to dry out. Add broth and lentils, season with garlic powder, garlic flakes, salt and pepper, and bring to a boil. Then reduce to a simmer and cook ten minutes. Half way through, smash some lentils against the side of the pan with a wooden spoon to make the broth thicker. Serve with fresh herbs and yogurt on top. Just enough tuna, just enough beans, just enough of everything to make this a great lunch. This travels well as long as you keep it refrigerated. A great, healthy lunch ! 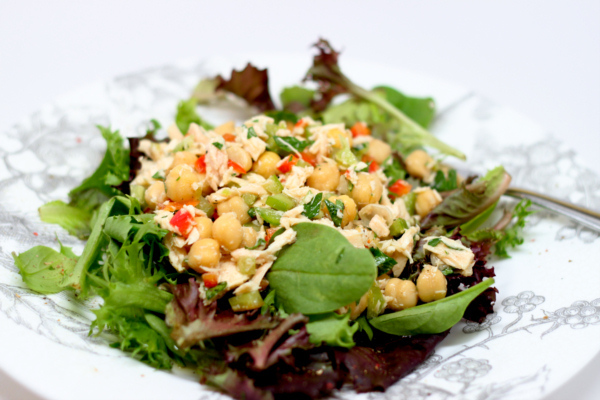 Combine beans, tuna, bell pepper, parsley, 1/4 c lemon juice and 2 tablespoons oil in a medium bowl. Season with salt and pepper. Mix the rest of the oil and lemon and toss with greens. Plate greens and sprinkle with salt and pepper then top with the tuna mix. Fresh from the garden ! 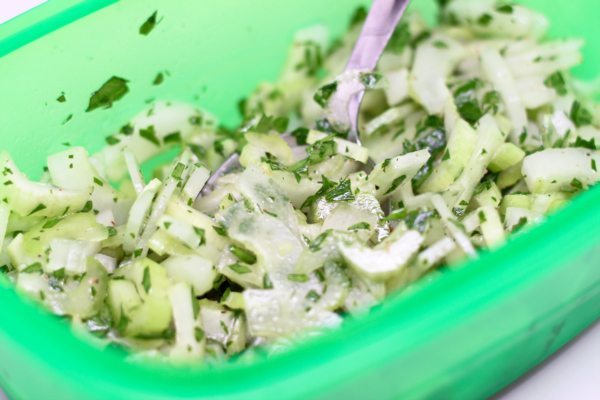 A quick side salad of cucumbers and celery. Oh so good. Combine all in a bowl and mix well. I love being able to throw together a meal in the morning and not think about it again until it’s time to put it on the table. Chicken Marrakesh is a great dish with the subtle flavors of cuisine from Morocco. 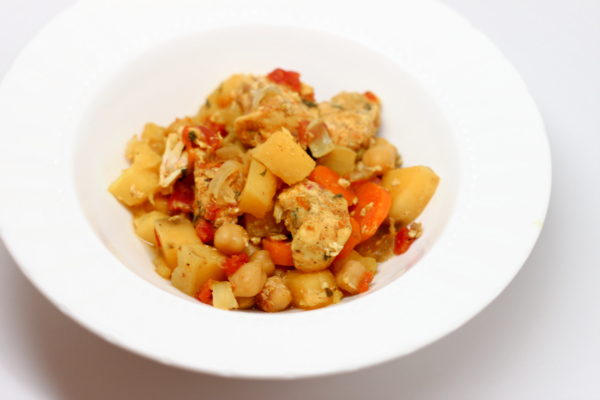 Place the onion, garlic, carrots, sweet potatoes, chick peas, and chicken into a slow cooker. Stir herbs into tomatoes then pour tomatoes over and stir well. Cover and cook on high 5 hours or low 8-9 hours. I can’t stop eating this !! It is just delicious. 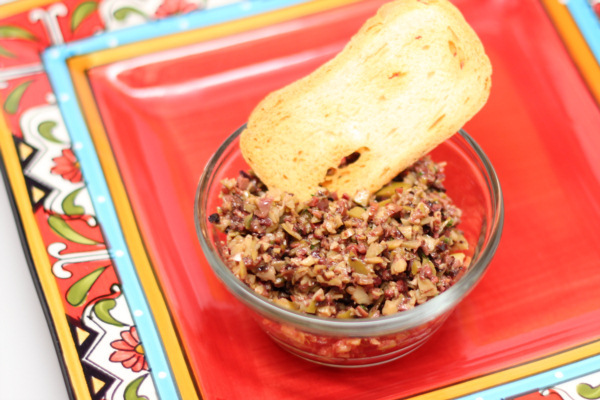 Serve as a spread on sandwiches, or as an appetizer with melba toasts or some other cracker. Place all in a food processor and pulse until chopped pretty fine. Serve with crackers or pita chips. This is one of those ‘all in one dishes’ that I love to make. You can make it ahead of time, refrigerate, and then do the baking right at the very end. Very convenient, very easy, very good ! You can make this casserole ahead and refrigerate until you are ready – just bake longer (about an hour) to make sure it heats all the way through. 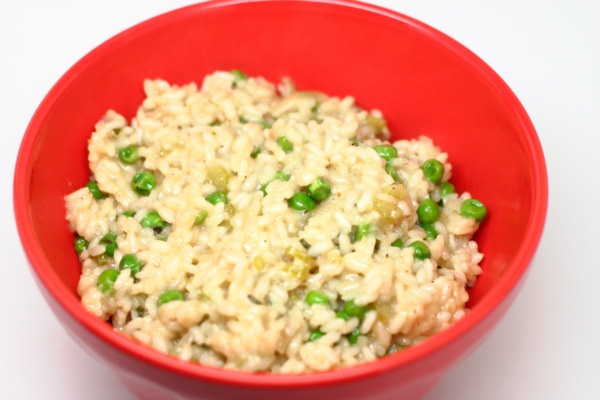 Mix water and rice and bring to a boil then lower to a simmer and cook 35-40 minutes. Drain and reserve. Heat oil in a large Dutch oven or soup pot and cook mushrooms 12 minutes or so to release all the liquid and allow it to dry up. Add broth and scallions and cook 5 minutes. Sprinkle in flour and stir then add milk and simmer 2 minutes. Add cheese, sour cream parsley, salt and pepper and remove from heat. Preheat oven to 350 degrees. Spray a 9×13 pan with Pam and place the rice in as the bottom layer. 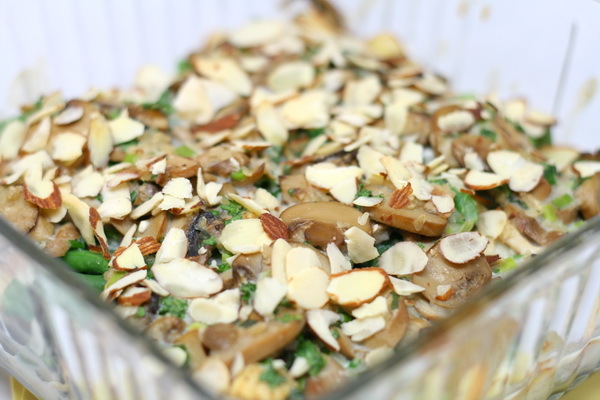 Top with chicken and beans then pour over the mushroom sauce and sprinkle with nuts. Cook 30 minutes and let stand a bit to cool before serving. Sometimes quick sauces are just as good as long simmered ones. This is one of those sauces. 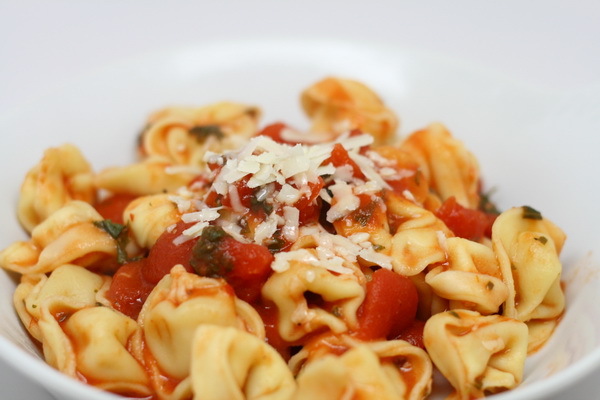 It’s full of fresh herbs and makes a great tortellini topper. Cook pasta according to directions and then drain. Mix broth, tomatoes, parsley and basil and cook 5 minutes. Add tortellini, salt and pepper and half the cheese. Plate and garnish with the remainder of the cheese.